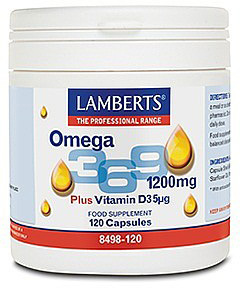 This unique formulation therefore emphasises the omega 3s obtained from oily fish (rather than the less well absorbed alpha linoleic acid source used by many companies), with each capsule providing a full 379mg of these essential fatty acids. The level of EPA at 196mg and DHA at 127mg is significantly higher than many other 3, 6 and 9 products that are available. DHA and EPA support the normal function of the heart and in addition, DHA contributes to the maintenance of normal vision. Lamberts have chosen natural olive oil as the source of the omega 9 fatty acid, oleic acid, with each capsule supplying an impressive 200mg. See ingredients on label. Contains Fish.